Convert flushing urinals and troughs into low-flush fixtures for a greener and sustainable washroom. Designed for maintenance of all low-flush, conventional flushing urinal bowls and troughs and no-flushing waterless urinal systems. ENVIRONMENTALLY FRIENDLY GREEN LABEL CERTIFIED. 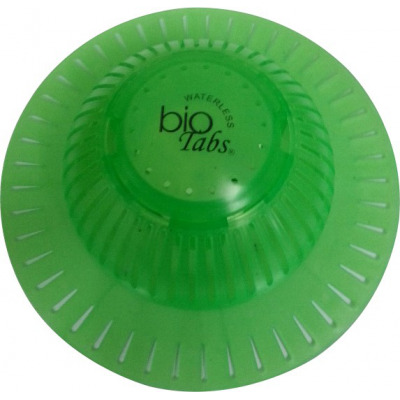 BIO TABS® keep urinals 24 hours clean, fresh-smelling and clog-free! BIO TABS® are designed for water-savings and trouble-free maintenance of all low-flush, conventional urinal bowls or troughs and no-flushing waterless urinals systems to save water, reduce sewer, eliminate odours and pipe clogs. BIO TABS® allow you to reduce the water usage and convert flushing urinals into low-flush or waterless fixtures instantly without additional costs. Ecological and refillable when empty, they reduce maintenance costs and protect the environment. Once BIO TABS® bio-active enzymes-producing bacteria are introduced to organic waste such as urine and ammonia, they produce powerful enzymes which eliminate these compounds and clear any organic material build-up throughout urinal drain and connecting plumbing lines. 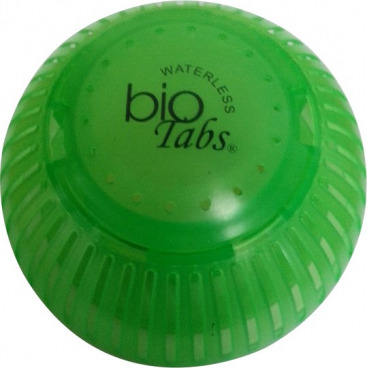 BIOTABS® SAVE WATER. Each BIOTABS® is good for 15,000 users/cycles and save up to 60,000 litres of precious water per urinal without flushing. NO ODOURS. BIOTABS® eliminate the source of the most offensive urinal odours. Problem-causing ammonical compounds in urine are completely and efficiently broken down by Urease, one of the enzymes produced by BIOTABS®. CLOG-FREE. BIOTABS® remove build-up throughout entire plumbing systems, keeping drain lines free flowing. AUTOMATIC AIR FRESHENERS. BIOTABS® dissolve slowly, releasing their biological active ingredients and a lasting refreshing scent to keep the urinal clean and fresh smelling for 24 hours a day. REDUCE SEWAGE AND MAINTENANCE COSTS. With continuous use, BIOTABS® attack plumbing build up, prevent drain clogs and increase the flow rate throughout the entire building and sewage system. ECO-MATERIALS, BIODEGRADABLE: All contents of BIOTABS® are biodegradable and environmentally friendly. BIOTABS® contain the same kind of material blend that should be added to septic and sewerage systems. ECO LABELLING, GREEN CERTIFIED. Awarded Singapore Green Label Certification No: 043-033. The packaging of BIOTABS® is made from recycled contents with oxo-biodegradable or bio-composite materials. Proven and tested to comply with the criteria of Singapore Green Label Certification, a global Eco-labelling Network which includes Good Environmental Choice, Australia Ltd and Environmental Choice, NZ. SAFE TO USE. 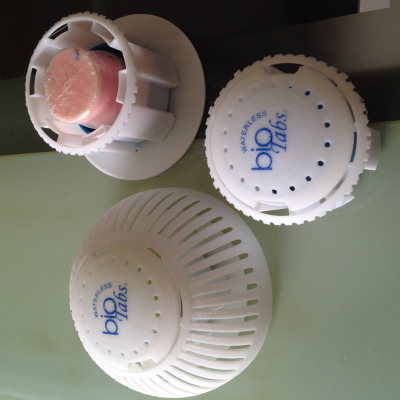 BIOTABS® contain the same kind of bacteria blend that should be added to septic and sewerage systems. Reliable as using patented and proven dosing systems. Australian Design Registration No: 336453, 336454 & 336455. International (PCT) Patent Application No: PCT/AU2012/000353. Place BIOTABS® at the centre of urinal drain of waterless urinal system or conventional flushing urinals. View video on implementing BIOTABS at Moscone Centre, the largest convention and exhibition centre in San Francisco, California, USA. All waterless urinals should be cleaned thoroughly every day as with any other urinals and pour/flush with 1 to 2 litres water after cleaning on each urinal at end of each day. EASY TO INSTALL: Remove urinal grate cover or strainer away from urinal. Turn clockwise to unlock the bottom disk and simply place the bottom end of the BIO TABS® against the centre of urinal drain. Start with a clean urinal bowl and free from drain blockage or drain pipe leakage. For low-flush urinal bowls and troughs including no-flushing waterless urinal systems, remove the control cartridge container and place only BIO TABS® 100 gram refill inside. NO-FLUSHING WATERLESS URINALS: Spray BIO PLUS® at least once to twice daily on urinal with Ready-to-use 500ML BIO PLUS® Waterless Urinal Cleaner/Deodorizer directly onto urinal surface and floor area underneath the urinal particularly on areas where urine spills usually occur in between cleaning and let dry. FLOOR & DRAIN MAINTENANCE: Dilute 1 part BIO PLUS® to 200 parts with water (Add 2 caps/50 ml to 10 litres water). Apply BIO PLUS® to clean the floor by mop and after cleaning, simply dispose or flush down remaining mop water into urinal drains on rotation at the end of each day to flush away any build-up of uric sludge may occur inside urinal trap and drain pipe. BIO PLUS® will enhance the BIO-ENZYMATIC action to remove build-up throughout the plumbing. PROBLEM URINALS: Check for slow flowing drain and drain blockage. For old urinal, use BIO TABS® with normal flushing over a period of time and reduce water down to 500 ml or 1 litre per flush for saving water, to clear any organic materials build-up out of drain pipe throughout the plumbing line. FOR STUBBORN STAINS: Apply DEEP-CLEAN™ directly to stain areas and upper section of urinal and leave it for not less than 3 minutes. Then brush all surfaces until stains have been removed and rinse off with water then spray BIO PLUS® on the urinal surface. SLOW-FLOWING URINAL: Pour in 1 to 2 caps (25 ml to 50 ml) BIO PLUS Concentrate with minimum 1 litre preferable warm water directly into urinal bowl and leave overnight. Repeat if necessary. CLOGGED URINAL DRAIN: Drop one BIO TABS® onto the urinal bowl and leave for 1 or 2 days until fully dissolved to unclog the urinal drain. NOTE: BIO TABS® are completely dissolved within 1 to 2 days without control cartridge if continuous dip or soak in flooded water. Use BIO PLUS® for cleaning and maintenance, please read product label. 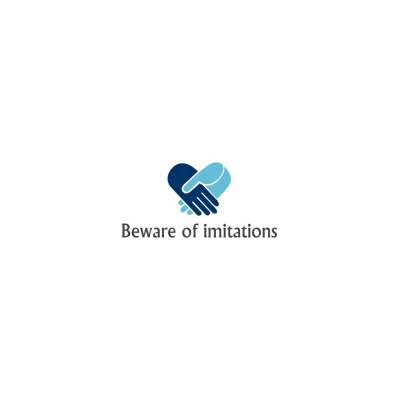 CAUTION: Do not use any harsh chemical, acidic toilet cleaner, sanitizer or bleach. DOSAGE - Each BIOTABS® is good for 15,000 users/cycles saving up to 60,000 litres of precious water without flushing.